Factual error: As Ray is driving around the country selling his machines, we see town mileage signs that are green with white lettering. In the early 50s they were white with black lettering. 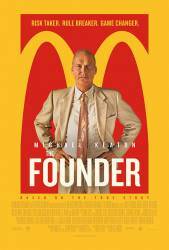 Continuity mistake: When Ray Kroc first orders a meal from McDonald's he is at the order window on the left. As soon as he walks away from the window he is at the right window. Continuity mistake: When Ray comes home and tells his wife about the business he wants to make, she is holding a cup. When the angle changes her hand is lowered. Ray Kroc: If you've got time to lean, then you've got time to clean. Harry J. Sonneborn: Mr. Kroc, if you're not making money hand over fist, something's terribly wrong. Ray Kroc: If I saw a competitor drowning, I'd shove a hose down his throat. Question: Two questions are puzzling me. 1. Considering the tactics that Ray used to take control of McDonald's from the brothers, couldn't it be said that he cheated and conned the brothers out of their restaurant? 2. When Ray visits Mac in the hospital, he offers him a blank check to which the brothers agree. Why would they agree to such a thing instead of fighting to get their restaurant back?